Next week, guests can get their hands on some new funky and fresh hats as part of Limited Time Magic! Starting April 1st, guests visiting Sarge’s Surplus Hut in Cars Land at Disney California Adventure can pick up their own Cozy Cone Hats. These hats, much like the popular Tire Hats sold in Cars Land, are inspired by Radiator Springs. 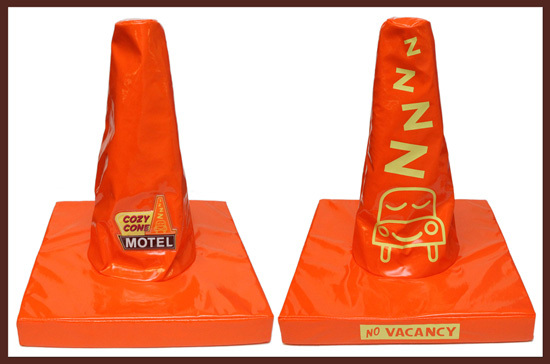 Designed after the iconic orange cones and neon sign of Sally’s Cozy Cone Motel, these hats are sure to draw attention. 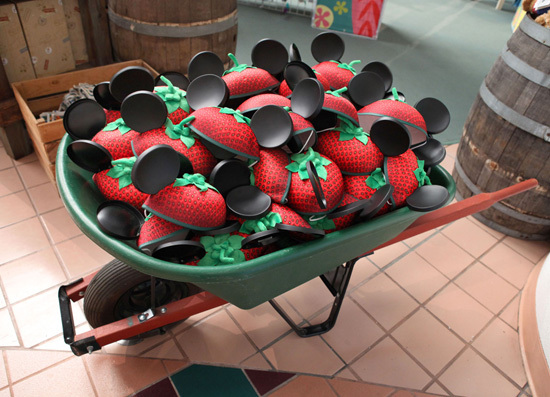 At Walt Disney World, guests visiting the Flower and Garden Festival at Epcot can ‘pick’ up a Strawberry Ear Hat. These hats take the iconic mouse ear shape and add a delightful strawberry pattern and stem. What a great way to enjoy the fresh fruit-filled festival! These hats will be available in the Festival Center between Mission Space and the Universe of Energy (previously known as the Wonders of Life pavilion). I think California is getting the better merchandise this round. Not only are the Cozy Cone Hats much more unique and original, the strawberry ear hats are not part of Limited Time Magic, but rather as part of the Flower and Garden Festival. Contrary to what the article on the Parks Blog says, these ear hats have been on sale since the beginning of the Festival. I saw them a few weeks ago, sitting alone in a corner. Because no one goes into the Festival Center, no one has seen or bought them. I think that branding them as Limited Time Magic is a way to sell them. They’ve been on sale before the Limited Time Magic event was announced, and they’ll stay on sale long after it ends. Not only is that cheap in and of itself, compared to the originality of DCA’s new hat, these ear hats are nothing special. Overall, this week’s entire ‘event’ is rather cheap. I have no doubt that these hats would have been launched some time in the near future anyway. So instead of a new fun event or meet and greet….we get hats. And it isn’t the first time they’ve done this, either. ‘Hats Go On Sale Week” isn’t the kind of thing we had in mind when Disney first announced the Limited Time Magic Promotion. I understand every week can’t be something huge, but we could at least do better than this. Make sure to check out all of our coverage on our Limited Time Magic page.